unashamedly borrowed songs from rhythm and blues performers. Elvis began his career with a cover of ‘That’s All Right’ by Arthur Crudup, an unpretentious blues singer. 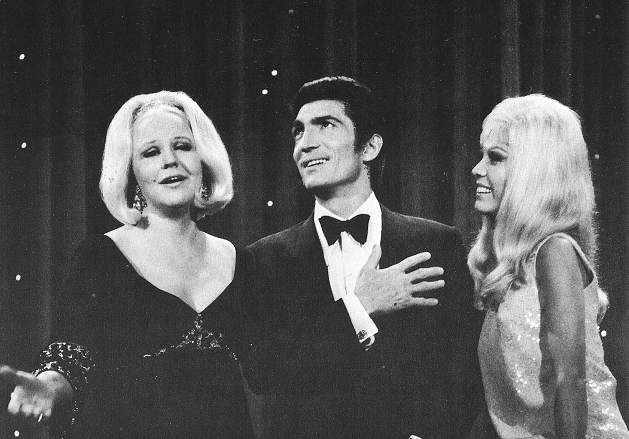 The second hit of Peggy Lee had even better rhythm and blues credentials. The song ‘Why Don’t You Do Right’ had been an earlier hit for Lil Green but had actually started life in the 30s as ‘The Weed Smoker’s Dream’, just about the time Bing Crosby was indulging his own and later denied affection for marijuana. 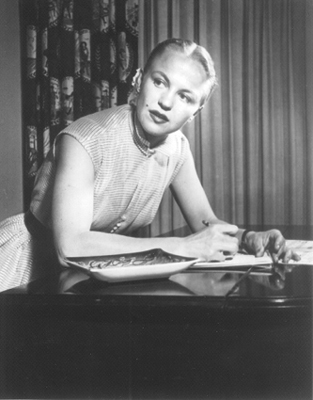 The two most famous songs by Peggy Lee were both originally rhythm and blues hits. Her big hits, ‘Fever’ and ‘I’m A Woman’, were originally recorded by Little Willie John and Etta James. Unbelievably, she outperforms Etta James on ‘I’m A Woman’. Both versions are great but Etta gets a little bogged down in indignation and protest. Peggy Lee is slick and her confidence evokes a word that has become used less recently. She is sassy. Lee changed the words of ‘Fever’ and made them funnier but her version of ‘Fever’ is, despite the success it obtained, a little tepid. Not short of sass himself, Elvis took the words of the Lee recording of ‘Fever’ for his own version. His decision indicates the complicated albeit short-lived ambitions Elvis had when he returned from the Army. ‘Fever’ connects what Elvis wanted back then, increased sophistication and continued allegiance to black music. Critics of Elvis now claim that he spoilt himself with sentimentality, that too much of his music was ‘sweet’. This, though, may be his default position. Categories are invariably unreliable but it is not ridiculous to argue that the best of his ballads evoke Peggy Lee and the worst remind us of Doris Day. The latter was what he settled for when he lost his nerve. In an outtake of ‘Fever’, he gulps after singing ‘Captain Smith and Pocahontas had a very mad affair’ as if he thinks he is claiming knowledge that is beyond him. His best ballads like ‘That’s Someone You Never Forget’ or ‘Starting Today’ may owe something to black singers like Bobby Bland but the restraint reminds us not only why Elvis was great but also why Peggy Lee was important. This is especially apparent in his recording of ‘I Need Somebody To Lean On’. This low-key but still bluesy ballad is drenched in the supper club next morning world of Peggy Lee. Without cocktails and flattery, intelligent understanding arrives, or ‘dawns’, a loneliness and reality that will not be extinguished by sunshine or daylight. Peggy Lee achieves something equally magnificent on her classic, ‘Don’t Smoke In Bed’. The singer and the song have no illusions. What awaits the departing woman will not be fun but the journey has to be made and whether she likes it, and although we have no doubt that she is justified, her conscience will always be scarred. This mix of sophistication, amoral disappointment and a sometimes-regretted sense of entitlement define Peggy Lee. Or at least when she is not having fun the day after. But we all know that she will return to the supper club for evenings because fun is important and no man frightens her. This tough smart cookie is the door that allowed white audiences to enter the world of rhythm and blues. The minimalism was important. It helped the white folks take at various sunrises the gentle steps into a world that was different from their suburban homes. The best of those realised that their lives were darker than they thought and were beyond the promise of their luxury furnishings. Some, of course, merely had fun. The door that led people to rhythm and blues swung both ways, which is why Peggy Lee attracts rock and roll fans and leads them towards jazz. Perhaps this begins for most people the day after a night before when the fun suddenly becomes less satisfying. Who knows? All is certain is that her best records like the best of Elvis make us think in ways that seem beyond the lyrics. 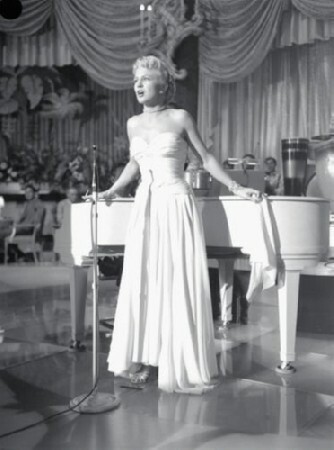 Peggy Lee was musical. She co-wrote songs and, something like the parents of Mary Shelley – William Godwin and Mary Wollstonecraft – she fell in love with Dave Barbour because of the way he played the guitar. Peggy Lee began as a singer who literally sang for her supper. Before she was 17, she sang on a radio show in Valley City, Dakota. The show was sponsored by the local restaurant and Lee was paid for her efforts with food. Her real name is Norma Deloris Egstrom, which means that the two sexiest American women were both christened Norma. theme song of any Western and is so good and the romanticism so cursed with heartache that it makes six feet five inch Sterling Hayden, the actor who plays Johnny, appear inadequate. Her triumph should not be a surprise. Peggy came from cowboy country. She was the daughter of a railway man and the sixth of seven children. ‘You Go To My Head’ is a great song that has lyrics that should convince anyone of the merit of unadorned English. Caressed by the vocal of Lee, the words sound Shakespearian. And finally, there is the Leiber and Stoller song, ‘Is That All There Is’. This tale of defiant despair and the emptiness of existence actually made number one in the American charts. But that is her strength, so often she has persuaded the American people and a lot of the rest of us to laugh off nihilism and brutal truth. The sassy smile is not merely about confidence; it represents triumphant resignation and calm bleak proportion. Inevitably, the albums are not consistent and have weak moments. She belonged to a bland age and the blandness paid the rent. Like Elvis, though, the gems exist for those who need the best of what she can offer. Again, like Elvis, she had fine moments on stage. Another coincidence is that they both did live versions of the Ray Charles hit, ‘I Got A Woman’. Her concert album with the talented jazz pianist, George Shearing, is delightful and she inspires Shearing. Nancy Wilson is a fine singer but her album with George Shearing does not compare. The opening of ‘You Came A Long Way From St Louis, simple but inspired, is so good it is addictive. Peggy Lee died just over 10 years ago. In her final concerts she sang while in a wheelchair and strangely she almost ended her career promising the immortality that her sophistication denied. She will live on longer than most and the good news is that the Real Gone Jazz label has released 2 box sets. Each set contains 8 albums and retails for under £15. Imagine, 16 albums of the great woman for less than 30 quid. If capitalism worked as efficiently as they say, those albums would cost a lot more. Another finely written piece. Howard always manages to provide additional and interesting details of his subjects. She has great talents. She wrote the Romeo and Juliet and Capn’ Smith and Pocahontas verses of Fever, I love the Elvis Presley version.